FBTBForums.net :: View topic - Do you prefer the AAT in sand-brown or blue? Posted: Tue Jan 06, 2009 2:52 pm Post subject: Do you prefer the AAT in sand-brown or blue? I prefer the original AAT. wish lego would bring it back. The original has always been one of the reasons I like TPM. The droids were amazing bad guys in THAT film. The new one represents the stupid droids and thus isn't as good. "You may fire when ready"
I like the original FAR better (yes i have it). I'm not even buying the new one. I like the original one if for no other reason that it was reasonably priced. I happen to have neither. However, when I saw CW, I said "What the heck, why didn't they keep brown?" So brown all the way. The old one rocks so hard: printed pieces, tan/brown pieces, tan droids, awsome and simple design. Yes, it is a little skimpy compared to the new one, and I admit I completely love the new one's design, but, I'm all to easily disgusted with the new CIS color scheme. Ecchh! A. They need either SBDs or Droidekas to be deadly. B. They need a big souped up tank to be deadly. To define B, I mean that the AAT's deadliness is increased to make the droids more dangerous while escaping their stupidity. However, I think the old one would look better modified with new parts. I must say that I definately prefer the tan version; in fact I think it's one of the best Phantom Menace sets produced. It holds up just fine with all of the 2007 redesigns. Love it! Posted: Tue Jan 06, 2009 6:14 pm Post subject: Re: Do you prefer the AAT in sand-brown or blue? The new one is an improvement on the design, but I prefer the TPM color scheme. I prefer the new AAT. I don't own it (yet), but I did have the old one, and I surely do not regret selling it a few years ago. 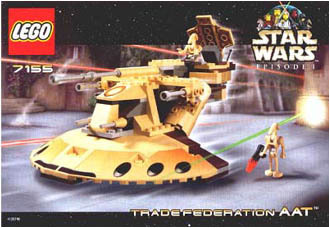 It really did not have much an interior, and like most LEGO Star Wars sets at the time, was rather crude in design (i.e. dangling gun cannons). I always had a feeling Star Wars sets could be much better designed (I was validated when 2002 rolled around). The only thing that stops me from getting the AAT now is, of course, the price. I'll await a sale. I really think that the tan and brown look better on the old AAT, but I don't own either, so my judgement comes from just looking at pictures. Sure, the design of the new AAT is nice, and so are the minfigs, but $50 just for that? Come on! I think that more people would like the new AAT if it were priced around $30. When i first saw pictures of the new AAT, i estimated a $30 price for the set. However, it turns out that I was WAYYYYYY off. Now, if the set was $30, I might actually say I like the new one more, but at the current price, it's a rip IMO. 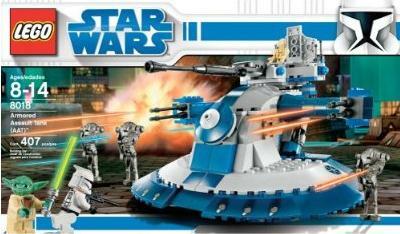 But LEGO can't make a tan and brown AAT and call it a clone wars set, because the one in the movie was blue. Let's just hope that TLC will release ep1 sets in the future and hope there's an original TPM AAT set. Frankly I don't have much of a preference, but like Master Fetty I'm a little annoyed by the stupidity of the new battle droids which is slightly represented by the new blueness of the AAT. The original AAT belonged to the Trade Federation, and was brown by their choice. When the Trade Federation joined the CIS Separatists, they changed the color on most weapons/tanks to the blue color scheme (such as dwarf spider droids). I'm actually not sure which I like better. The original is skimpy in design but a classic, and has the tan coloring (thus making it the canon version). However, the new one has a good parts-to-price ratio, comes with a new Yoda (which is far better than the old one), a clone, 2 droids that are identical to the ones in the old set (minus the blasters), and 3 super-pimped out rocket launcher battle droids. Plus the tank is beefier and more detailed, plus I just like the blue color scheme. *NOTE:* The old AAT actually had a good parts-to-price ratio too, because it was 100-something pieces for $19.99 (USD). I always forget that because on Ebay and Amazon the prices for the old one are rediculous. I could go either way on which I prefer. I preffer the colour scheme of the old classic one. But I like the shape/design of the new one new better. Same here. Though I own neither, so I guess the point is moot. All in all, I don't have any AAT. The new one is fine by me, despite its color. I just want an AAT. I don't have either set but I prefer my AAT in tan but I also like the new design. I might pick up the new AAT at some point though. I like the blue. I don't know, I guess it just seems "fresh" and I like the change-up. Couple that with the fact that the new designs is better IMO, and I'm really liking this model. I'm really not sure about it. I think the original tan design is better in all respects (coloration and design). Though the new one is sleeker, it has ridiculous proportions, especially the gargantuan side-arm blaster cannons. I'm not particularly excited about the new minifigs, either (not ready to condemn the new Yoda, but I don't think he's an improvement over the old one). I like them both ... because they both relatively accurately depict the vehicle as seen in two different forms of showing the star wars saga. I like them both and will most likely display them side by side. I like to see different variations on the same vehicles and minifigs. I know people here tend to want things to stay similar, but I just find that boring. Are the major blue parts from the new set available in brown or tan? I do own the old version, but I don't own the new version (as I think the price is ridiculously too high, especially in CND). But like others have mentioned, even though the design looks better, the proportions of the new one are just WAY off. And I too think that all of the Trade Federation equipment looked way better in tan and brown. So, for me, the old one is the winner. Oh, and BTW, that new Yoda looks ridiculous. Seriously. Sure the new one is nice and spiffy, and it's got cool pieces and colors, but the old one holds higher sentimental value for me. The original colorschemes of the droid army were much better looking, in fact if their space fleets would have retained these colors they would have been much more imperial looking as something of a foreshadowing to the next few movies. But the old one wins, all the way, because it represents a better time, when minifigs had yellow heads, and non creepy faces. The building/design of the second one is better and it has more minifigures.